The Apple Filing Protocol (AFP) is a network protocol that offers file services for the Mac OS. If you are not using Samba, this is the recommended method to upload and manage a large amount of files, including directories and sub-folders or very large files. Once the network drive is mounted, you can manage the files just like you would do with any other drive on the computer. You can only use AFP when both your network drive and the computer are connected to the same local network. 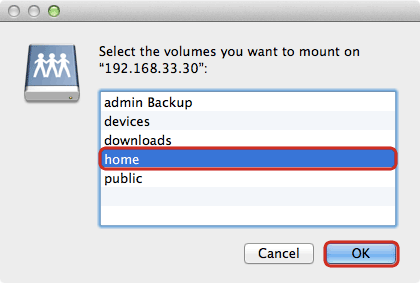 If you are not at home and would like to access your files remotely, this method does not work. As an alternative, you could mount the drive using WebDAV, although the transfer rates will be slower and there are some other limitations as well. Instead, you might want to consider using FTP or if you don't have to upload a large amount of files, simply use the web interface. Select your network drive from the list of SHARED devices and click Connect As…“. 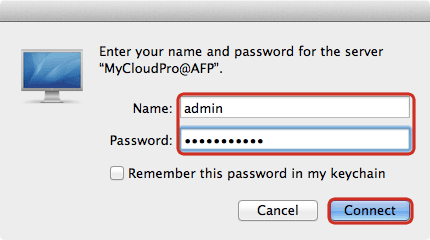 Your device is listed under the name that you have set as host name with the addition of @AFP. 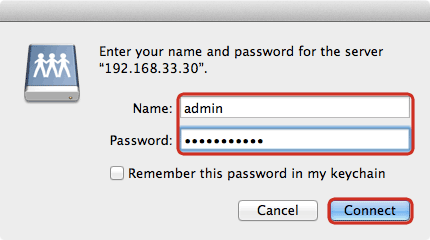 Enter the login credentials of your user account on the network drive (e.g. admin/admin) and click Connect. You can now access the data on your network drive. When no longer needed, click Disconnect to terminate the connection. Choose a folder from the list and click OK.